I really was slacking in my sewing during the last week. My husband spent a lot of the week traveling for work, and well...the kids were just exhausting. My 2 year old wasn't napping much and there just weren't a lot of breaks (until Friday when they spent the day with my in-laws). 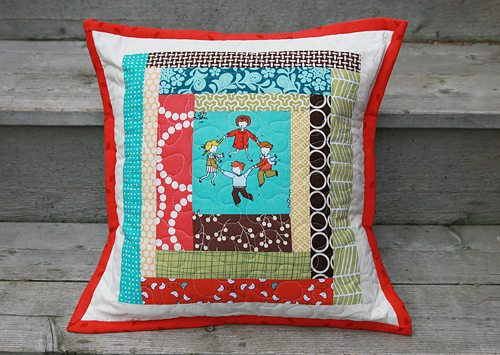 I did finish a couple pillows though! I am kind of embarrassed to admit that these have been sitting around for at least two weeks, waiting for me to finish and hand stitch the binding. But I just love how they turned out. 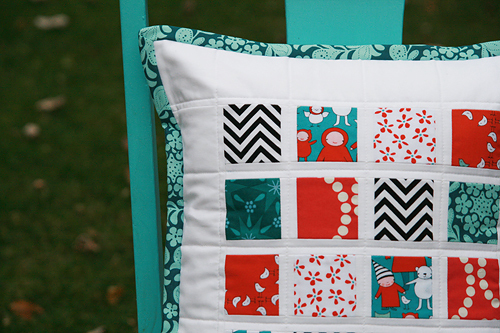 One features Aneela Hoey's Little Apples fabric (again). 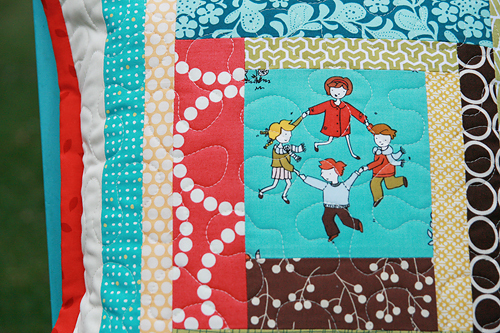 I built a log cabin around the children playing in coordinating prints and then quilted it in a free motion meandering design. 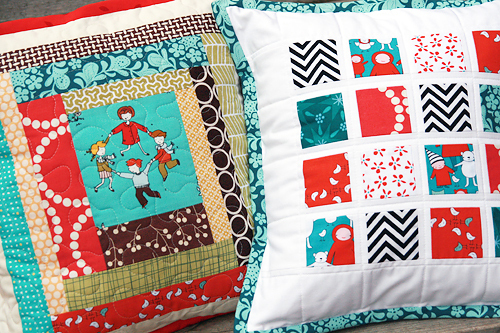 The second pillow features the new Meet the Gang fabric (and coordinating prints from my stash) which is crazy adorable. This one is quilted with straight lines between the multicolored squares. I made these for my Etsy shop, I thought I should add a few smaller ticket items for the holidays. Is anyone else doing that as well? I'm going to spend the next few days finishing up my Christmas tree skirt. Those of you who follow me on Twitter have seen a lot of sneak peeks of that project. I can't wait to share it with you all!